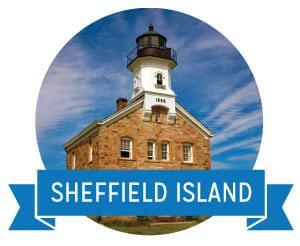 Activated in 1868, the Sheffield Island Lighthouse – now listed on the National Register of Historic Places – was in service for 34 years until its retirement in 1902. Today the Norwalk Seaport Association’s volunteers maintain the lighthouse and grounds as a museum and nature preserve. Visitors can board the Seaport ferry at the Sheffield Island dock, adjacent to Stroffolino Bridge, corner of Washington and Water Streets, South Norwalk for their trip to the island, the lighthouse or harbor cruises. Each year the ferry takes thousands of visitors back to a time when this and other lighthouses were critical to coastal and oceangoing shipping. Once on the island, visitors are treated to a tour of the lighthouse, including a chance to climb up into the light tower itself, where on clear days, the New York City skyline can be seen. The 10-room lighthouse showcases period furniture, and offers a chance to see what life was like for the families of 19th century light keepers. Another island attraction is the Nature Trail through the Stewart B. McKinney Wildlife Refuge, which completed by the Seaport Association in cooperation with the U.S. Fish and Wildlife Service. From a viewing platform, a variety of wildlife including nesting herons and other birds can be observed. Check out the Sheffield Island Ferry Schedule here!